There are several factors that contribute to ulcers and being aware of these can help to reduce the risk in the future. Gastric ulcers are an erosion of the horse’s stomach lining due to prolonged exposure to acid. Vets use a grading system of 0-4, with 0 being no ulcers and 4 being extensive, deep ulceration. Symptoms are varied but include signs of abdominal discomfort, weight loss, colic sypmtoms, poor performance, reluctance to eat and irritability when girthing. Gastric ulcers are most common in the squamous mucosa, or non-glandular region, of the horse’s stomach. Although gastric ulcers might seem like a recent phenomenon they’ve probably been afflicting horses for decades, it’s just that more vets now have endoscopes long enough to view the horse’s stomanch and can see the ulcers. As more research has been carried out, our understanding of the severity of the problem has increased. Estimates suggest that around 40% of leisure horses, 60% of competition horses and 90% of racehorses could be affected by ulcers. Gastric Ulcers occur when acidity overwhelms the natural acid protection systems of the stomach. The squamous region of the horse’s stomach is particularly vulnerable as it doesn’t have built-in protection and insted relies on buffering from bicarbonate in saliva, the physical presence of fibre to act as a ‘mat’ on top of acid in the stomach and the fact that, under normal circumstances, acid shouldn’t be in contact with this region of the stomach for prolonged periods. Low-fibre diets: Fibre takes longer to chew than concentrates, creating plenty of saliva, which in turn helps to buffer acidity in the stomach. Good doers on calorie-controlled diets can be just as vulnerable to EGUS as racehorses, as their daily ration is low in fibre. Horses were designed to spend 16-18 hours a day eating and as soon as this is reduced, a horse is at risk of EGUS. High-cereal diets: A study carried out in Denmark showed that feeding more than 2g per kilo of body weight of starch per day or 1g per kilo of body weight per meal were two of the most significant factors in the development of gastric ulcers – a high-starch diet creates a more acidic environment in the horse’s stomach. This would equate to a 500kg horse being fed 1000g of starch a day or 500g per meal. If a mix contains 20 per cent starch, feeding 2.5kg would provide 500g – the maximum suggested for one meal. Fast or intense exercise: Speed can push acid into areas of the stomach that are vulnerable to developing ulcers. Fibre in the stomach can act as a barrier, stopping the acid from splashing around and damaging the stomach lining. Stress: Even horses and ponies that are turned out 24/7 suffer from ulcers – in one study horses developed ulcers when some of the group were removed from the field. It is clear that EGUS is a multifunctional problem in which stress plays a role. Feed plenty of forage to increase chew time and therefore saliva production which will naturally regulate the levels of acidity in the stomach. Use low-calorie forages for good doers to provide chew time without weight gain. Focus on feeding little and often – dividing the total forage ration in to as many small meals as possible helps to keep the time the stomach is empty as short as possible. Try to avoid the use of cereal-based concentrates as these create more acidic condition in the gut. Instead use more digestible fibre sources like alfalfa with added oil to meet the energy requirements. For example, Dengie Healthy Tummy provides 11.5MJ/kg of slow release energy, which is the equivalent to a medium energy mix. 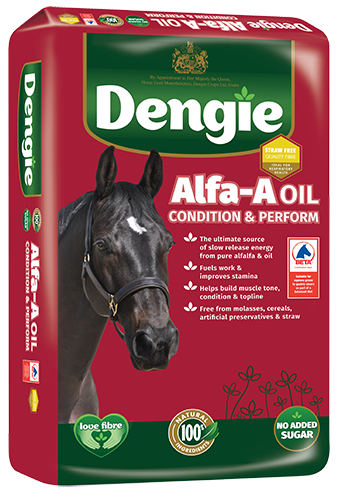 On a kilo for kilo basis Dengie Alfa-A Oil provides the same energy level as a conditioning or competition mix. Include alfalfa in the ration, as research has shown alfalfa is a better buffer to acidity than other fibre sources due to its protein and calcium content. Feed a small amount of fibre in the time before tacking up to ride so the horse doesn’t have an empty stomach when ridden – a handful or two of a chopped fibre is ideal. 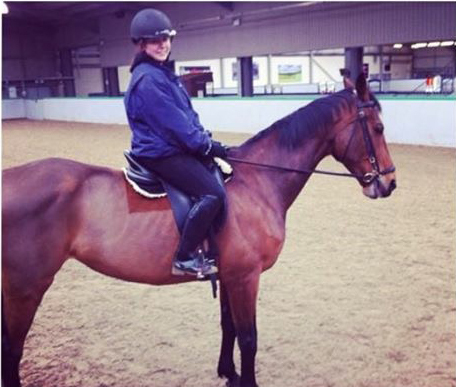 The exercise intensity may need to be reduced for horses with ulcers to allow time to recover. Turn out as much as possible and try to avoid any unnecessarily stressful situations. 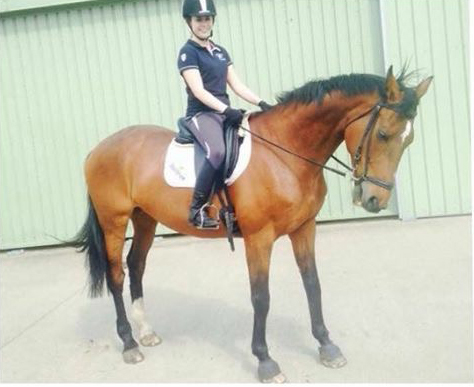 A 16.2hh Warmblood mare who previously worked at medium level dressage was reowned for being stressy, a poor doer and unsettled in the stable. She was given a gastrocscope which confirmed the presence of ulcers. The Dengie Nutrition team recommended the following diet. Dengie Healthy Tummy 2.5kg – a pure alfalfa feed that provides a high specification of vitamins and minerals when fed at the recommended level. It is low in sugar and starch and contains Protexin In-Feed Formula which supplies prebiotics and yeast to promote a healthy microbial population vital for fibre digestion. After around 2.5 months on the new diet the mare was re-scoped and the ulcers had gone. 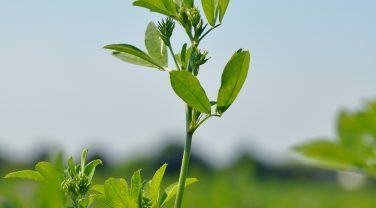 Feeding alfalfa alongside cereals and grass has the potential to counteract the negative effect of increased acidity in the hind gut as well as the stomach.